From history to present day there are many belief symbols. Some are of good omens and some are of bad omens. We even see some of these symbols in our dreams. Have you ever wondered what the turtle symbol represents in different cultures and meanings? In this article I summarize some of those symbol beliefs. What do they mean? The turtle seen in a dream indicates an unusual improvement. This would be a positive omen. Turtles in a negative aspect means fear of facing responsibility or reality. However, a turtle can represent long life because turtles live a long time. They also have quiet strength. In the west, early Christians viewed turtles as a symbol of evil forces during war. In the Hindu myth the tortoise Chukwa supports the world. The turtle also represents the creator and holder of the Earth and everything it contains. In the Balinese scripture -- Any person who consumes and supports the killing of turtles is not a good Hindu, and is doing a dishonor to himself, thus disconnecting himself from proper Balinese religious practices. Japanese - The turtle is a symbol of good fortune and longevity. The turtle is an positive omen bringing 10,000 years of happiness. The Cosmic Mountain and the abode of the Jennin are supported by a tortoise. Chinese - The turtle carries the world on its back. This is a symbol of fertility, vitality, and great patience. The Chinese believed these animals foretold future events. They are the third animal of four that represents water and was thought to be a model of the world. Its upper shell curved like the heavens and its lower shell was flat (the way the Chinese at the time believed the Earth was). They read the future in the pattern on the tortoise shell. The tortoise also supports the world. Its four feet being the four corners of the Earth. It is the Black Warrior, depicting strength and endurance. It was credited with a great life span and was therefore a symbol of longevity. As a warrior the tortoise joined the dragon on the banners of the imperial army. Both representing indestructibility as neither can destroy each other. The tortoise can not be crushed nor the dragon reached. 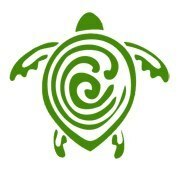 Polynesian - The turtle symbolized fertility and long life. African - The turtle originated ju ju and appears in fertility rites. It represents the feminine to the serpent's masculine power. Greco - As the feminine power of the waters, the turtle was an emblem of Aphrodite/Venus in Greco-Roman myth. Native American - The totem symbolizes the relation between the tribe and it's ancestors. Human and animal figures are sculpted on a trunk and offerings are made to these sacred totems. "Great Turtle -- The wisest of all creatures in Iroquois mythology." The Ojibwa, Saulteaux, Cree, and Iroquois people view the turtle as a symbol of Mother Earth and referred to the continent of North America as Turtle Island. They viewed the hard outer shell, which protects a living being, as an analogy to their mother, the Earth, also a living entity. The Sioux and Taters believed that the world is a huge tortoise floating on the waters. For the Aztecs, turtles were a symbol of cowardice and boastfulness. Hard outwardly but soft inwardly. The turtle is a creature of two elements, Earth and water. The people of the Turtle Clan share an affinity with both. They enjoy helping things grow, both plants and people, yet require freedom to do their own things, as the turtle has its freedom in the water. Turtles will often leave a pool or pond before a draught arrives. This is a warning of a change in climate. Different cultures have their own belief systems, some dating back to ancient times. Beliefs are nothing to be ashamed of, they are a part of what makes you who you are today. A woman, of Native American heritage, once emailed me and told me that a turtle had crossed her and her child's path that day. She said that this was an omen of good luck in her beliefs. I found this to be a touching reminder of how important turtles are in all of our lives.